Poke in its natural state. It’s that time of year in Harlan County, Kentucky. Time for the Poke Sallet Festival. It’s been many years since I attended the Festival, but I have many memories of it. “What is poke?” you ask. It’s a weed. It grows out in the woods. It doesn’t look like anything you’d eat. It also doesn’t taste like anything you’d eat. Legend has it that folks would go into the woods, pick it and put it in bags. Bags of course were–and still are–called “pokes.” You cook it down–often boiled–and slop it onto a plate. A green onion and cornbread usually completes the presentation. 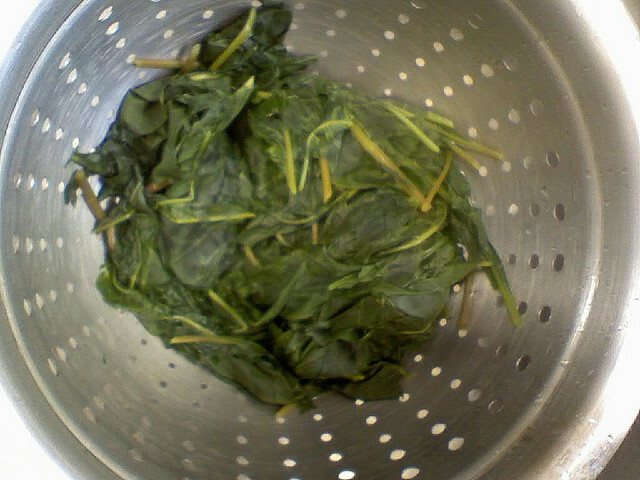 The foul weed prepared for eating. I’ll admit that I’ve only eaten poke a couple of times. It’s foul. It smells bad when it cooks and on your plate. I think it is served with an onion to give the diner something to kill the taste. It’s kinda like kale, only more pungent and weedier tasting. 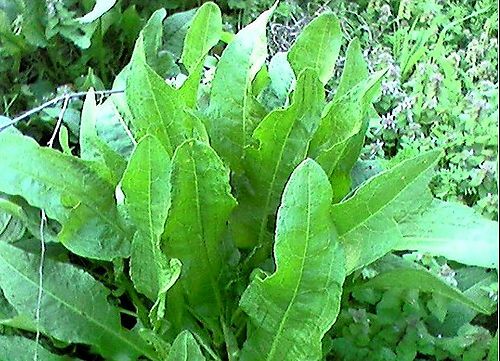 Like all greens, it also has a violent laxative effect when eaten in large quantities. I don’t know what in the world “sallet” is, except a mispronounced word. Sallet isn’t any easier to say than “salad,” but I guess that doesn’t matter, does it? Besides, poke isn’t eaten in a salad, as far as I know. It’s just cooked down into a slimy, nauseating mess. Why am I writing about poke? Because I enjoyed the Festival when I was a kid. For several years, my father was the chairman of the Poke Sallet Festival. I was a little kid, and that impressed me. Dad seemed like a big deal. I liked that. I don’t know why Harlan County chooses to honor poke. Seems like every Kentucky county has a festival for something. I guess Harlan wanted something, too. Coal was probably too obvious a choice. We don’t have much else. There are a lot of things from childhood that I don’t remember well. But I remember the Poke Sallet Festival. What do I remember? Gladys Hoskins: She was the long time boss of the Harlan Chamber of Commerce and lived across the street from us. I don’t know if she was Chairperson or President or what, but she was the boss. She and Dad worked every year to bring it all together. I can still see Mrs. Hoskins smoking a cigarette and–always–dressed to the nines. Stone Mountain Park: It might have been Stone Creek, but it’s where the Festival was held when I was a kid. It was somewhere up around Smith. It was a couple of shelters but pretty nice–or I thought so. Eventually, things moved to downtown Harlan which makes more sense. Plus, there’s slightly less chance of getting killed in town. The Red, White and Blue Band: There was always music at the festival. One year, The RWBB played. Never heard of them? They were, as Dad said, “a bunch of hippies.” It was the late 1960’s/1970’s early and that’s what they were, I guess. Actually, they were from Clover Fork in Harlan County. The lead singer was Merle English, one of my Mom’s students at Evarts High School. Someone told me they played Acid Rock. An old man said they looked like “dope fiends.” I loved them. I’m pretty sure no one else did. As you might imagine, the bands were usually country or bluegrass. Years later, English became Max English and a successful lounge singer. True story. Jimmy Skidmore: Jimmy liked to dance. He danced to whatever the band played. He could dance the hell out of any song. No partner required. He was a nice guy and had a helluva good time. I’m sure today’s more politically correct world would frown on this. That’s a shame. He had fun and everyone enjoyed it. Alfred: I don’t his last name, but he could sing. He also didn’t have front teeth, leaving him with prominent fang-like canines. But, like I said, he could sing. He would usually sing Six Days on the Road or Okie From Muskogee.He would belt them out. Good stuff. The Governor: Governors Louie Nunn and Wendell Ford would come to the festival. Ford was great. He would eat poke, shake hands and pose for pictures with everybody. Nunn was good, too. One time they presented Nunn with a portrait painted by a local artist. It was pretty good, but for some reason Louie’s face was painted with a scowl. When it was unveiled, his reaction was roughly the same look. Even as a small child, I knew it was funny. Dad laughed himself silly. Steve Lyon: He was Mrs. Hoskins’s son-in-law. He was a hippie–or at least I thought he was. He had LONG hair and a beard. In case you haven’t noticed, I was a bit fascinated by hippies. By “a bit,” I mean a lot. We didn’t have hippies in Harlan, but I’d seen them when we went on vacation. Steve was definitely a hippie. Anyway, he was also a musician. A pretty good one, too. He played at the Festival one year. He played the electric organ and sang a song about throwing his mother down the stairs. Even my Dad was impressed. Much like the Red, White and Blue Band, he wasn’t the audience’s idea of entertainment, but he was good. Virgil Q. Wacks: Virgil Q came to the Festival to film highlights for his weekly show Virgil Q. Wacks Variety Time. His show was part advertising, part travelogue. He filmed around Eastern Kentucky, Southwest Virginia and East Tennessee. He used an old-fashioned, windup camera with no sound. He would narrate the film on his show. His trademark was the extreme close up where he would zoom in on his subject until the picture blurred out. He would also refer to most people as “smiling” and “genial,” regardless of how unfriendly or even dangerous looking his subject was. Virgil Q always excited the crowd, because you knew you might be on television. It’s hard to describe Virgil Q’s show, but we loved it. Any time I hear the old song Happy Days Are Here Again, I think of Virgil Q. By the way, I don’t hear that song all that often. The Melting Pot: The Festival was a true Harlan County melting pot. People from all over the county came to it: Loyall, Harlan, Wallins, Evarts, Cumberland, Benham, Lynch, Chevrolet, Cawood, Cranks, Smith, Punkin Center, Ages, Verda, Lejunior, Lenarue, Catrons Creek, Pathfork, River Ridge, Holmes Mill, Baxter, Keith–every town, community, camp and holler was represented. Harlan County is sparsely populated but 50 miles wide. You can live your whole life in the county and never see some parts of it. The Festival was where everyone gathered. It’s been over 20 years since I’ve been to the Festival. By then, it was already firmly established in downtown Harlan. The poke dinners were served at Jay’s Restaurant. I took a friend of mine with me. He was running for some office and wanted to go to Harlan to meet people. This was during the last gasps of the United Mine Workers Union in Harlan, and the UMW was out in force. A lot of union folks were dressed in camouflage and fatigues like some militia. My most notable encounter was with local character and raconteur, Rubber Duck. I introduced him to my friend, whereupon The Duck said: “Buddy, can you believe I got run over by truck?” My friend looked at The Duck’s scarred up face and said: “Well, yeah…I can believe it.” The Duck responded: “It takes more than a truck to kill The Duck!” That’s about all I remember, but, man oh man, did that make me laugh. Back to the poke. I don’t recommend it. I think it’s something people ate back when there wasn’t much food. You’d find something growing and eat it. If it didn’t kill you, it was food. My Dad said he used to eat mush, which he described as “not fit to eat, but that’s all we had.” Poke is like that. Now, I know people who eat poke and claim to like it. Maybe they do. I’ve known people who ate souse and other vile foods and claimed to like them, too. I’m sure poke has all sorts of nutritional value–antioxidants and whatnot. I’ve heard people say that it can cure various ailments. That may well be true. If you say it is, I really have neither the knowledge nor the energy to argue with you about it. I still don’t like it. Nevertheless, it makes for a helluva festival. Corbin, Kentucky has a Nibroc Festival, which is just “Corbin” spelled backwards. I guess Harlan could have the Nalrah Festival, but that sounds like some Middle Eastern deal. Poke it is and should forever remain. Based on the photos I see of the modern Poke Sallet Festival, it doesn’t resemble the one of my youth. There are bands with real stages and sound equipment. Sometimes, all we had was a guy with a banjo. Honestly, it’s probably much more entertaining now. Plus, you don’t have to drive all the way out to Smith. It looks like there are multiple venues for entertainment, too. Of course, there’s still the poke, but I bet you can get lots of other stuff to eat now, too. Progress is a good thing. There a lot of things I don’t remember about my childhood–birthdays, school events, holidays. I remember a lot about the Poke Sallet Festival, so it must have been pretty good–all except the poke part, I guess.